Learn online poker with our free poker school. Texas Hold'em isn't one of the greatest, most absorbing games on earth by accident! It's appeal lies in the fact that although it takes 5 minutes to understand, it takes a lifetime to master. EuroPoker.com has created a handy ten-step guide, designed to provide you with all the information you need to enjoy the greatest game on earth, Texas Hold'em. Stay with us and we will give you poker tips and free poker lessons, in fact you'll get everything you need to conquer any online poker table. Step 1 - Some ground rules. Hold'em poker is played with a standard 52 card deck. The difference lies in the use of five community cards – by this we mean five cards that are dealt face up on the table and that all players share. Every poker player receives two cards from the dealer – these are known as hole or pocket cards and make up your starting hand. Every round of poker starts with each player receiving their two hole cards. The winner is the player who, after several betting rounds, can use his hole cards together with the five community cards to create the best ranked five-card poker hand. Step 2 - How good is your hand? And what are the best ranking hands we hear you ask! This is simple. The player who can put together the highest ranked five-card hand out of the seven cards (five community plus two hole) wins the pot. How this hand is put together doesn't matter. Whether four community cards and one hole card or both hole cards and three community cards make up the winning hand - is of no consequence. Sometimes the five community cards may make up the best hand. If this occurs, all the poker players share the pot. What does not change is the fact that a hand always consists of five cards. 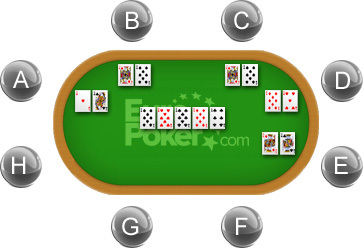 If two players hold a pair of aces for example, the high card kicker will decide the winner. Step 3 - Who has the showdown hand? Step 4 - The dealer button. The button determines the order of play. It is a visible marker that rotates clockwise between players before each new hand is dealt. The player seated left of the button always acts first in each betting round. Logically, the player in front of the button acts last. This player has a huge advantage since he can see and judge the actions of the other players before deciding his own actions. In the case illustrated above Player A acts first, Player B second and Player C who is on the button, acts last. Step 5 - What are the blinds? After players are dealt their hole cards, 'placing the blinds' occurs. These are small forced bets that ensure every single pot has a small value and blinds are only placed before the first betting round. 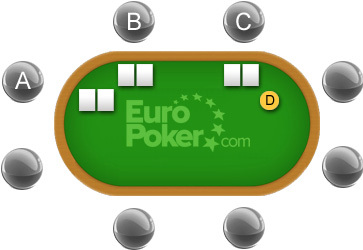 In Hold'em, the two players left of the button (in the case below players A and B) are obliged to place these small bets. Blinds must be placed. As the button moves before each round begins, so does the obligation to place these blinds. It is always the two players left of the button that pay the blinds and their value depends on how big a game you are playing. Step 6 - How are betting rounds structured? Now the blinds are in place it's time to start betting! The first betting round is known as the pre-flop betting round. It begins with just the hole cards in play. When it is completed, the flop betting round begins - with three of the communal cards having been dealt now in play. Next comes the turn betting round where an additional community card is dealt. Finally we have what is known as the river betting round. Here, all five community cards are now on the board. Step 7 - Time for action! Call – this means matching a previously made bet. Bet – this means wagering a sum of money. Check – this can only be done if there are no bets in play and in doing this, the action moves on to the next player. Fold – this means dropping out of the pot and not wanting to call any made bets or raises. Raise – this means increasing the wagered amount. Step 8 - A little more information on actions. It's important to remember that a betting round is not over until every player has either matched the highest amount wagered or folded. When this is complete all the wagered chips are added to the total pot and a new round of betting begins. As mentioned previously, the player left of the button acts first again. 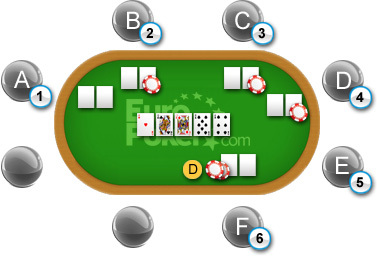 Please note that placing a forced blind counts as an action so during the pre-flop (first) betting round it is the player in position three from the button who acts first since players one and two are forced to place blinds. Step 9 - How are table limits defined? When it comes to wagers, every poker table has a certain, defined limit. This limit determines the forced blind amounts. In a $1/$2 game the blinds would be $0.50 for the small blind (seat 1) and $1 for the big blind (seat 2). Please note that the blinds are different. Usually the small blind is half the value of the big blind. For example, in a $3/$6 game the big blind is $3 and the small blind $1.50. It's very important to choose the right level of play. Think like this – if you have $100 you don't want to play at $10/$20 level since you would risk having to force bet your entire stack of chips before getting any good cards. Step 10 - Playing with no limits. This is the most popular variation of Hold'em. In No Limit, any player at any time can bet or raise an amount determined only by the amount of stacks in front of him. By going 'all-in' he bets all his chips in one go. If someone with an even bigger stack raises him, the first player doesn't automatically lose but will only win an amount equal to the size of his own stack. In limit Hold'em bets are restricted to the blind levels. For example, in a limit $3/$6 the first bet must be $3. A raise would mean betting an additional $3 – no more, no less. Step 11 - Now you're ready to play! Now you've gone through our ten-step guide to the basics of Hold'em. As we said at the start, the beauty of this game is its simplicity, however we recommend you read this guide thoroughly until you understand every step completely. Once you've done this, the best way to learn is to play, picking up the main points as you go along. You'll be surprised how quickly you'll get into your stride! Once you're comfortable with the rules EuroPoker.com provides lots of other great tips to help you improve your game and become a winner. Oh yes. We forgot to mention the first rule of poker – have fun!